An unsuccessful manufacturing partnership with the wrong metal fabrication company can be a costly waste of time. However challenging it may be, taking the time to choose the right partner will result in a long-term and beneficial experience for your organization. Choosing the right metal fabrication partner no longer has to feel like attempting rocket science. Asking the right questions will ensure that you are making the right decision for your organization, whether your focus is on time, quality, or a very specific budget, these are the questions that you should be prepared to ask your fabrication partner. 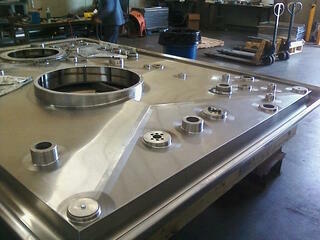 All metal fabrication companies are not created equal. With different specialties and levels of experience, taking the time to understand the focus of your potential partner will allow you to not only save time and money but to ensure that you have an understanding of the values and focus of the company. Rather than focusing on price, focusing on the value offered and time saved will allow you to make the best decision for your organization. Will a Tour of the Facility be a Part of the Commitment Process? Taking a tour of the facility floor before making a commitment will allow you to confirm the company’s ability to follow a smooth and efficient process, ultimately saving time. With time often a top concern, ensuring that the factory is clean and organized has to be a top priority. Asking for proof that the manufacturer prioritizes a dynamic and organized experience for its customers will allow you to build trust in order to focus on what matters more to you and your organization. Why should you ask for references? References are the best way to hear directly from similar organizations about their experiences. Not only should you ask for references, you should be prepared to ask questions about turn-around time, how quickly issues or problems are addressed, and quality of the final product. Although the number of years an organization has been running does not always guarantee the best quality, a combination of experience, references, process, and values do make a significance difference when choosing the right metal fabrication company. Look out for early warning signs and allow yourself to walk away if you feel uneasy. Trusting your partner is not optional, but necessary in developing the right partnership. At All-Type Welding & Fabrication, Inc. we eagerly share our 30+ years of experience because it matters. Understanding that we have maintained relationships that have spanned over three decades and continue to grow roots in our community with new and established organizations alike is a reminder that experience shapes companies for the better.